Cameras on phones that can pick up unseen images from around corners? Seriously? Yes, apparently, according to the results obtained from Ramesh Raskar's research team. The key to this new technology is something called femto-photography. Femto-photography, as described in the Wikipedia link, is "a term used to describe a technique for recording the propagation of ultrashort pulses of light through a scene at a very high speed. A femto-photograph is equivalent to an optical impulse response of a scene and has also been denoted by terms such as a light-in-flight recording or transient image. ". Or, in other words, a camera that can visualize images at a rate of one trillion frames per second - so fast it can pick up light itself in motion! As shown by Ramesh Raskar in this video, Ramesh's team was able to record the motion of a light pulses through a plastic soda bottle using femto-photography. This same video is well worth a view, since it also helps to understand better the concept of seeing around walls. 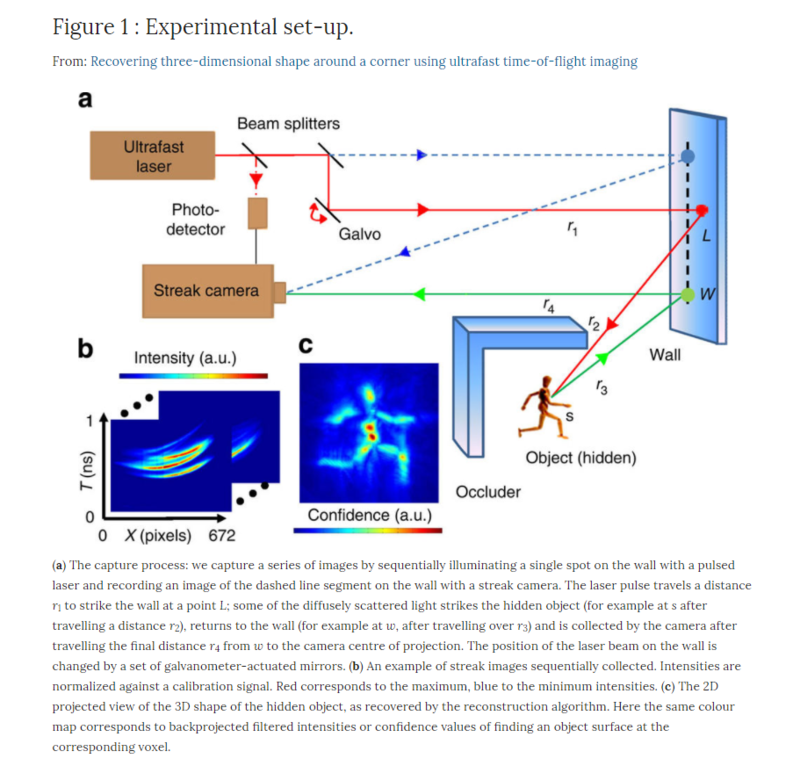 So once Ramesh's team had discovered the amazing value of femto-photography, other ideas arose, mainly the concept to photo-capture objects around corners. There is a detailed process to this, described in all its physics and mathematical glory in this Nature.com article. But it can be explained more simply. At it's core, the process involves, most importantly, a laser and a specially equipped camera. The laser sends out very fast laser light pulses toward a flat surface, such as a wall or floor area, positioned at such an angle so as to allow the hitting laser light waves to bounce out toward the hidden object. Light photons then bounce off the hidden object and back toward the same flat surface, where again, they do another bounce-off. With this last bounce-off, some of the photons may travel back toward the camera stationed right next to the laser. The camera will pick up these light photon impulses. Keep in mind something very important here - one little photon will not do the trick (and that's if this one photon even makes it back to the camera! ), to determine the spatial dimensions of the hidden object. And that's where femto-photography technology steps in - because there are billions, trillions of light pulses sent out per second, the probability increases that many photons will come back to the camera and increase the ability to determine the hidden object's structure. Then, along with certain computer algorithms that use time and spatial conglomeration of those incoming photons, the object's final approximate image can be determined.